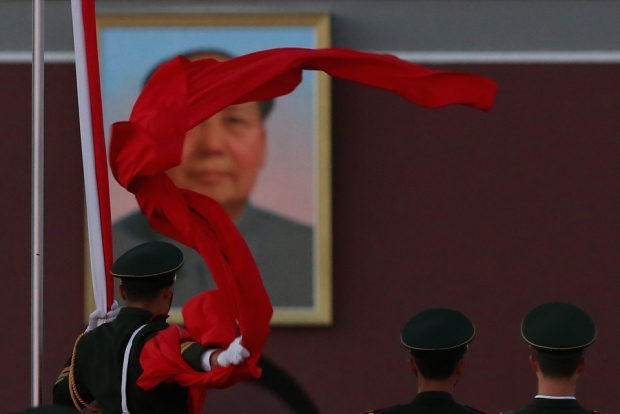 A paramilitary police officer collects the Chinese national flag during the flag-lowering ceremony at Tiananmen Square on November 13, 2012. A version of this piece appears on the Chinese language website of the New York Times. Just a little more than a week after the American presidential election, China will choose its own leaders in its own highly secretive way entirely inside the Communist Party. What’s at stake for China—and for the rest of the world—is not just who will fill which leadership posts until 2022 (two five-year terms are the norm) but whether, ten years from now, the Communist Party itself will still rule China. Most of the overseas reporting about the turnover has focused on predicting the line-up of new leaders and trying to anticipate in what direction they will take the country. This is a near-impossible task because the aspirants have hidden their policy views to avoid making mistakes that could derail their ambitions. But there are some structural features of the turnover in plain sight and are just as consequential for China’s future. The politicians who lead the party are crafting the process to save the Party and protect their own interests as well. Here is a short guide to a few of the hard choices China’s current leaders will be making in this week’s selection process. Figuring out how to transfer power at the top in the absence of an open and legitimate leadership selection process is the biggest political challenge China faces. Most authoritarian governments are brought down by splits in the leadership, not by revolts of the masses. According to political scientist Milan Svolik of the University of Illinois, two-thirds of the authoritarian leaders who were overthrown from 1946 to 2008 were deposed by élite insiders. The recent Bo Xilai affair and the apparent internal differences over how to punish Bo have made Party leaders particularly jittery about the dangers of internecine conflicts. If they don’t get the power-sharing process right during this transition, the Party might not survive the next decade. Bitter rivalries at the top could break out into the open during the next domestic or foreign policy crisis, especially if it stirs public protests, too. China’s leaders still remember the lesson of the 1989 Tiananmen crisis: What brought the PRC to the brink of collapse was the split in the leadership over how to respond to the protests, not the protests themselves. The rules of the political game in China are in flux as the Communist Party struggles to maintain élite unity and popular support in a society dramatically transformed by market economics and increased connection to the outside world. After Mao Zedong died, Deng Xiaoping tried to stabilize Party rule by institutionalizing a system of term limits and mandatory retirement. Getting Jiang Zemin to step down as general secretary in 2002 was a significant achievement—the first time a major communist leader left office peacefully—and no one seriously doubts that Hu Jintao will follow precedent to leave office after serving two terms. As they compete with one another, however, Chinese politicians are making and remaking the rules, most of which are neither written down nor publicly articulated. They sometimes expand the size of the Politburo, China’s top governing body of roughly two dozen, and of its inner core the Politburo Standing Committee to balance the power of different groups. The upper age limit for appointment to the leadership bodies has been lowered over time—it is now sixty-seven—as the leaders have used it as a convenient tactic for eliminating rivals and reducing the number of eligible contenders. A smaller PBSC should do better at overcoming vested interests to pursue much-needed economic reforms. And it should make for a steadier and more prudent foreign policy as well. The trade-off, however, is that narrowing the apex of the pyramid to seven aggravates the power-sharing problem. Right now eight members in the Politburo, the twenty-member body just below the Standing Committee, are eligible by age to be promoted. If the Standing Committee has only seven slots, then in addition to Xi Jinping (next General Secretary) and Li Keqiang (next Premier), who already are members of the Politburo Standing Committee, only five of the eight contenders can be appointed to slots. (It is also possible for an unusually promising star who is not yet a Politburo member to helicopter up into the Standing Committee.) Will the three whose ambitions are denied go quietly into the political wilderness, or will they become disgruntled losers who act out by trying to mobilize a popular following as Bo Xilai did when he was campaigning for promotion? The risk of disgruntled losers is heightened by the absence of an open, fair, and binding selection process. For the past decade, these two control bureaucracies have exaggerated the threat of popular unrest to claim bigger budgets and expand their reach over society. Chinese sociologists and other critics complain that the so-called “stability maintenance” operation is turning China into a police state that only serves to alienate the public. Due process has all but disappeared because the Supreme Court, the Justice Ministry, and lower courts take their orders from the Party’s politics and law committees under security czar Zhou Yongkang, who has emerged as one of the most powerful figures in the country. Under propaganda czar Li Changchun, China’s massive censorship operation has seriously damaged the credibility of the government by blocking and filtering online content that appears innocuous to everyone else. Kicking these portfolios off the PBSC would be a significant signal that the rest of the leaders are willing to challenge these powerful bureaucracies in order to improve the Party’s repute. It also would improve the odds for reforms that give the courts and the media greater autonomy from Party interference. Those monitoring China’s engagement in climate talks, its relations with the United States, and its territorial disputes with its neighbors should look to see whether China’s topmost foreign policy official, the head of the CCP Foreign Affairs Office, is granted greater authority by elevating the position to the rank of Politburo member. China is a major player on the world stage yet, at present, its senior foreign policy official lacks the authority to manage a foreign policy arena that has become crowded with different agencies and state corporations promoting their own agendas and diluting the power of the Ministry of Foreign Affairs. As a mere ordinary member of the Central Committee—a body of more than 300 members—he holds the same political rank as the other ministers or generals. No wonder the current occupant of the position, Dai Bingguo, complains that no one listens to him when he tries to rein in the nine civilian maritime agencies, the state energy corporations, and the PLA Navy that are antagonizing China’s Asian neighbors by going their own way in the South China Sea. If China’s leaders recognize the need for more effective foreign policy restraint to head off the growing backlash to China’s provocative behavior, they should make the next foreign policy czar a Politburo member, as Qian Qichen was in the 1990s. Xi Jinping will have too many other responsibilities to handle foreign policy coordination on his own. That’s why in most other governments the foreign minister is one of the most important members of the cabinet. Anyone tracking China’s rapid military modernization or worrying about recent hints of military insubordination should watch closely to see whether when Hu Jintao retires as Communist Party head, he also cedes his post as commander-in-chief. In 2002, the other leaders eased Jiang Zemin into retirement by allowing him to stay on as chairman of the Central Military Commission until 2004. The existence of two separate centers of power—Hu Jintao became General Secretary and President, but Jiang still gave the orders to the People’s Liberation Army—made the entire élite, including the military officer corps, very uneasy. Particularly in foreign and defense matters, no one knew who was actually in charge. After two years, Jiang finally stepped down from the Military Commission and handed it over to Hu. But according to many accounts, Jiang used this two-year transition to solidify his informal influence over personnel appointments and policy decisions. Many Chinese critics blame the broken policy process during the Hu Jintao era on Hu’s failure to assert his authority under the shadow of Jiang’s continued influence. Hu’s full retirement from all his posts at the same time would enhance his legacy as a leader who promoted the institutionalization of Communist Party rule and clear lines of civilian authority over the military. But it would leave him, his associates, and his family less protected from the anti-corruption investigations that have become a feature of elite competition in the post-Mao era. The issue with the most far-reaching consequences for everyone concerned about the fragile stability of Communist Party rule is how the leaders are actually chosen this time around. If the top leaders are unable to agree in the smoke-filled room, might they opt to let the Central Committee elect the winners for the first time? Immediately after the Party Congress, the new Central Committee will meet to cast votes on the new leadership line-up. According to the CCP’s constitution, the Central Committee, a body of 300-400 central Party and government officials, provincial leaders, and PLA officers, has the authority to elect the leaders who sit in the Politburo and Politburo Standing Committee, including the General Secretary. Up until now, however, the Central Committee has never been given any real choice of candidates. Instead, its members have docilely cast their ballots to ratify the slate of names—the same number as the number of slots—prepared by a handful of top leaders in a secretive, highly concentrated process. One of the deepest mysteries is: Who is in the smoke-filled room? Most observers believe that the core group consists of the current leader (Hu Jintao), the future leader (Xi Jinping), and the previous leader (Jiang Zemin), but other current and past PBSC members may also be consulted. Another puzzle comes in trying to understand the basis for the horse-trading over who gets what seat. Many people believe that the negotiations revolve around the distribution of seats among personalistic factions—the networks of loyalty between senior political figures and the officials who have worked with them, are from the same region or studied at the same university and who have risen through the ranks with their patrons—the Jiang Zemin faction, for instance, or the Hu Jintao faction. Other people believe that, nowadays, the balance among organizational interests such as state-owned companies or the internal security bureaucracy is more important than factional balance. In my 1993 book, The Political Logic of Economic Reform in China, I called the Central Committee the “selectorate,” the élite constituency whose preferences have to be taken into account even if they have never as yet exercised their authority to actually select the leaders. The politicos in the smoke-filled room don’t know for sure when the officials in the Central Committee might muster the will to just say no. Twice in the history of the Soviet Union, the Central Committee rejected the official nominees for top jobs. And the Vietnamese Communist Party today chooses its leaders by a multi-candidate election within the Central Committee (the top vote-getter becomes General Secretary, the first runner-up gets the Premiership, and the second runner-up becomes President). To avoid the risk of a run-away selectorate, the CCP held an informal straw poll to gather information about the preferences of Central Committee members, one before the Party Congress in 2007 and another one just a few months ago. But the top leaders were reluctant to actually give up their monopoly over the selection process. After all, it would mean the loss of patronage, less protection for them and their families after retirement, and an unpredictable trend toward open political competition within the Party and beyond. That’s why they never announced and were not bound by the results of the popularity contests. If China’s leaders are deadlocked in the smoke-filled room over the composition of the new collective leadership—and if they want to reduce the danger of disgruntled losers who might cause trouble, as well as the slight possibility of rejection by the selectorate—this might be the moment when they throw the selection to the Central Committee and claim credit as the architects of intra-party democracy. This is how institutional change happens—not by grand design, but by lesser-of-two-evils gambles by self-interested politicians. If they cling to the old-fashioned secretive method of allocating power this time around, the odds are that it comes unraveled over the next ten years and brings the CCP down with it.